Even though you're building a backyard track instead of a pro track, spend a few minutes at the Dirt Wurx website. These are the guys that build the motocross tracks for the pro riders. They've put together an awesome set of tutorials on designing and building a full-size pro motocross or supercross track. 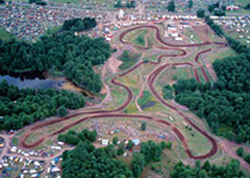 Just remember that most of that info is for the pros - don't base your backyard track design on a professional motocross track design. If you have neighbors nearby, noise may be an issue. 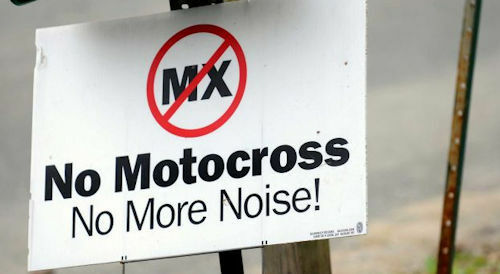 Trail bikes should be fine but motocross bikes, especially the four stroke motocross bikes, might be a potential excessive noise problem. During the dry summer season dust may also become an issue. It may help to put up a fence or a buffer of trees. The buffer zone will help with both the noise and dust as well as providing an 'out of site out of mind' cushion, but check with your building department to see if there is a setback requirement for the fence and plan the track accordingly. If your property is not surveyed, err on the side of caution and stay well away from the perceived property line or better yet, pay to have the property surveyed. Having your own track to practice on is great, but riding with friends is much more fun. And if you're thinking of riding competitively in the future you'll need to learn how to pass and/or get through a turn when other riders are in the way. Accidents can happen, so talk to your insurance agent to find out what your homeowner's policy covers. Consider talking to a lawyer to find out what might happen if someone gets hurt on your track. Even though they're your friends, find out if you should have them sign some sort of waiver. You may also need to consider trespassers, especially if your track is located away from your house or is wooded, which makes it more difficult to monitor. If someone gets hurt you may say it was his own fault because he didn't have permission to ride there, but someone else may say it's your fault for not securing the perimeter of the track properly. Posted signs aren't expensive and are usually available at hardware stores, and you can also find them on Amazon. Amazon carries the standard yellow Tyvek® Posted signs that have a space for your name and address, as well as the plain orange/black Posted No Trespassing signs that don't require a name or address. Another idea is to post video surveillance signs and maybe even some inexpensive dummy surveillance cameras. You could always buy real security cameras or trail cams but that can get expensive, and unless the bike or rider has some specific markings it'll be difficult to identify the trespassers even with the video footage. Hopefully you won't have to go that far. Putting up a fence is also an option, but adds to the cost of the project so factor in the extra expense. Some States require your name and address to be on the posted sign in order for the sign to be legal while some States don't, and some trespassing laws indicate how far apart the signs need to be posted - usually between 50 to 100 feet apart. It's a good idea to research trespassing law regulations for your State by searching for 'trespassing laws [your State]'. For instance, the trespassing laws in Maine indicate that you can use paint in lieu of posted signs but there are specific guidelines that need to be followed. Massachusetts trespassing laws are all listed on one page so you'll need to read the sections to find the ones that apply to your situation, but Section 121A and 122 towards the bottom of the list look like they'd be a good place to start. Proper drainage is very important. Water is going to seek the lowest point and will take the path of least resistance to get there possibly causing erosion ruts in the process, especially on hilly terrain. It's a good idea to do a bit of research on drainage and erosion control beforehand so you can figure out how to allow the water to get where it needs to go without taking your expensive dirt with it and ruining your track every time it rains. It may be necessary to add sections of drainage pipe in some areas, and the easiest and least expensive pipe is corrugated plastic pipe. The plastic pipe needs to be covered with a good amount of dirt because drainage pipe isn't designed to have dirt bikes landing on it, and will get punctured or crushed if it's not sufficiently buffered by dirt. Drainage pipe is also slippery (even when dry) which can cause the back wheel to wash out if the pipe becomes exposed. To keep costs down, try to work with the natural terrain, and don't get carried away in the beginning. A couple of single jumps and a whoops section will be plenty. Don't make the jump ramps too steep, and don't use the whoops spacing from the pro tracks - those guys are riding pro bikes and their suspensions are set up differently (not to mention they have a ton of experience). Try to keep the whoops in a straight part of the track, not near a turn (unless you have some riding experience), and three or four whoops is a good number to start with until you figure out the proper height and distance. If you make eight or nine whoops and find out the spacing is wrong, you've spent all that time and energy to build the whoops and now need to spend the time and energy to change them. You could have spent that time riding. Start with a whoops spacing of around eight feet, and a height of about two feet, and take it from there. This step isn't necessary, but every bit of planning helps, and many great projects started out as scribbles on a piece of scrap paper. Your track design map doesn't have to be fancy or drawn to scale but if you're stuck, seeing the track layout on paper may show the problem area. It also allows you to get input from friends who may see potential problems that you might have missed. Having a basic drawing also makes it easier to do the math and estimate the cost of the track. 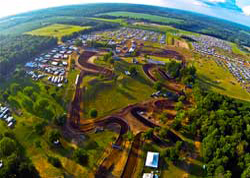 In the image below, the black and white MX track design pictured to the left is Spring Creek MX track and the color track design on the right is Unadilla MX track. Both are pro tracks not backyard tracks, but if you're computer-savvy the pro maps can give you a few ideas for creating a map of your own. If you have a large enough parcel and decide to dig a pond in order to get the dirt for the jumps, it might be a good idea to check for buried utilities. Even if there are no houses where you're putting the track, there still may be a main or secondary utility transmission line underground in the area. They're usually signposted with small metal signs, but if it's a rural area the signs may have fallen off, rusted off, or been rubbed off by a deer. Underground utility location is usually a free service so it's a good idea to call an underground locator hotline to make sure nothing is beneath the ground. There may be others, but here's a link to the Call Before You Dig website that has each State's contact info. If you need to bring in dirt for jumps and whoops, price it out ahead of time as it's fairly expensive. Ask what kind of dirt is available. Clay soil holds its shape better than sandy soil, but sandy soil drains better. Clay soil is also very slippery when it rains. 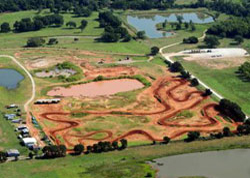 Loamy soil is the best choice for a dirt bike track, but it's also the most expensive. Dirt is usually sold by the cubic yard so there's a bit of math involved but it's not very difficult and there are some cubic foot calculators available online if you don't want to do it longhand. Some of the calculators are for things like mulch, but it's still converting cubic feet to cubic yards so the yardage will be the same for dirt. Be sure to ask if delivery is included in the quoted price and it's a good idea to over-order a bit because if you end up needing just a few more yards of dirt you'll have to pay the delivery charge again. Plus, the dirt on the track ends up getting compacted and will need to be topped off so the extra dirt gets used eventually. Go for screened dirt. Buying unscreened "fill" dirt might save you a few dollars, but you'll pay for it in the end with the expense and aggravation of punctured tires when your dirt bike lands on the submerged pieces of concrete blocks, wood and/or metal. Buried debris can also increase the possibility of an accident. If you're going to move the dirt with a wheelbarrow and five-gallon pail instead of a machine, unscreened dirt is a lot harder to shovel and doesn't fit well in five-gallon pails like screened dirt does. Most tracks are built at the back of the house so make sure there is access for the dump truck to get as close as possible to the track area to keep manual labor to a minimum. If he has to drive across the lawn, find out where your septic tank, well, and leach fields are. 1) Measure your area. Lets say you want to build a small motocross jump that's 8' long by 4' wide by 2' tall. 2) Multiply those three numbers to get 64 cubic feet. 3) Divide the 64 cubic feet by 27 (there are 27 cubic feet in one cubic yard) to get a total yardage of 2.37 cubic yards of dirt needed for that one jump. Don't forget to factor in the dirt needed for the ramp if the ramp wasn't included in the 8' measurement. Depending on the size of your track, it might be worthwhile to rent a mini-excavator for a weekend. Although it makes the job faster and easier it can also add complications, especially if you're not familiar with how to operate the machine. Have the rental guy go over the safety procedures as many times as is necessary - not just for safety's sake, but because the machine probably won't start if you don't follow the proper starting procedure. And forget the video of the five-year-old on You Tube that's driving a Cat D8 dozer around the yard - keep kids away from the machine. Finally - don't forget that Mother Nature doesn't care that you've finally got all your friends to come over on the weekend you reserved the machine. If she decides it's going to rain, it will, so find out if you'll need to pay for the machine even if you don't get to use it.